I can't remember if I blogged about this before. Oh well. Better twice than not at all, I say. 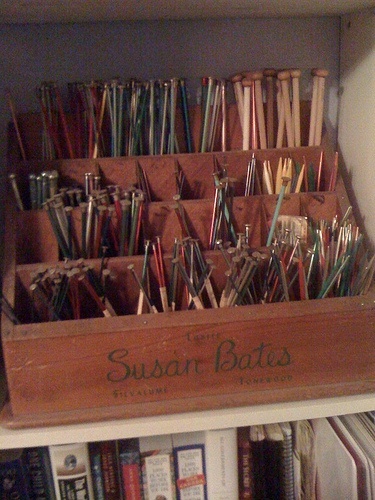 I think that it's just the coolest sorting box for straight knitting needles. I posted this picture on Pinterest and have had a number of people repin it, favor it or email me to ask if I knew where they could get one, too. I wish I did. Wouldn't a drawer under the needle section be wonderful for those small items? I have some glove needles that would disappear in this box. I wrote to the Susan Bates company but never received a reply. If you know where I can get one, or if you are a woodworker/entrepreneur and decide to make these vintage boxes, let me know. I'm interested!